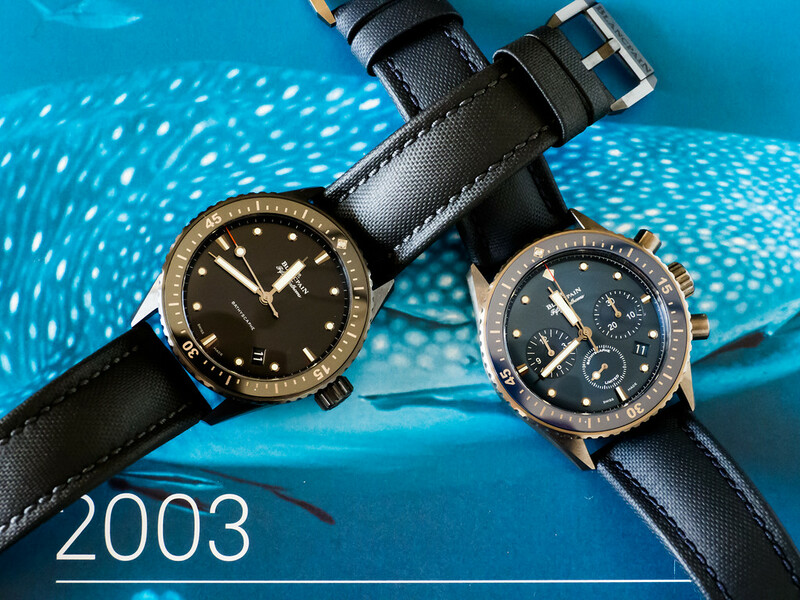 TimeZone : Blancpain » Which is your favorite Bathyscaphe? 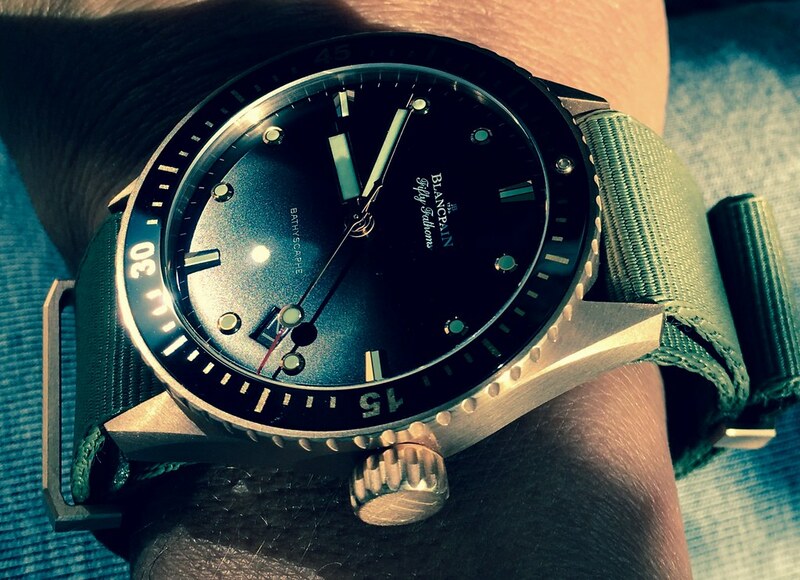 No doubt the Blancpain Bathyscaphe has had some tremendous success since it was introduced some years ago. The line was started with the 43mm steel and ceramized titanium versions, along with the white 38mm watch, all of those with the options of sailcloth or Nato straps. The ceramized titanium Bathyscaphe was quickly discontinued and replaced with a regular titanium version. We then saw the Bathyscaphe Chronographe arriving on the scene, featuring the newly developed high beat calibre F385. 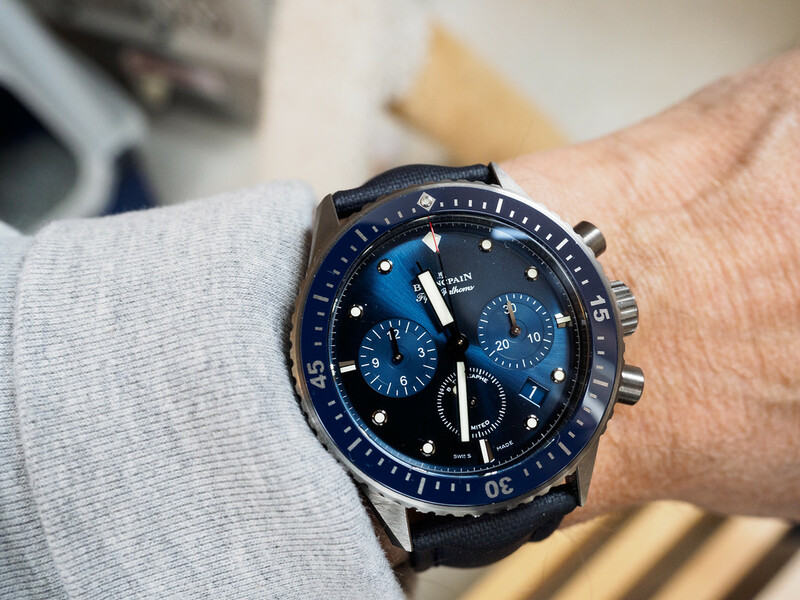 Special mention goes to the first Ocean Commitment Chrono with the Bathyscaphe featuring a stunning blue dial for the first time in a grey ceramic case. The Bathyscaphe then got an amazing bracelet, a black ceramic case, a blue dial time only Bathyscaphe in a grey ceramic case was added, there also are a limited 38mm Revolution limited edition, two new 38mm versions with black and blue dial in a steel case and of course the slightly controversial Ocean Commitment II with its blue ceramic case. That's a lot to choose from, a quite broad collection besides the regular Fifty Fathoms! Now, which is your favorite Bathyscaphe? Please let us know which version appeals to you most, and if you could share one or more photo(s) of the watch(es) that would be great. It is pure beauty. Still, I am very happy with my titanium version. 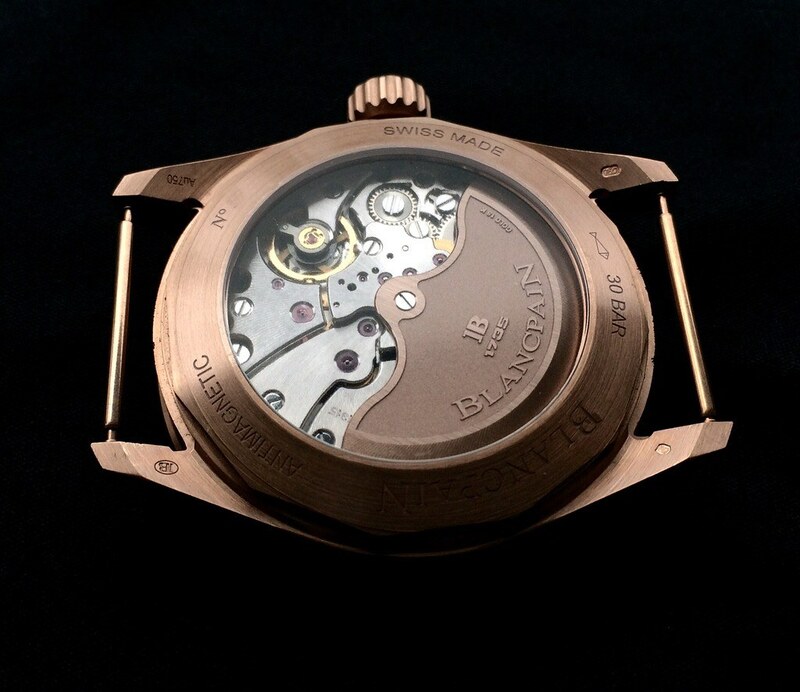 At the time I would have loved to have the ceramized titanium version, it seemed a truly revolutionary watch. 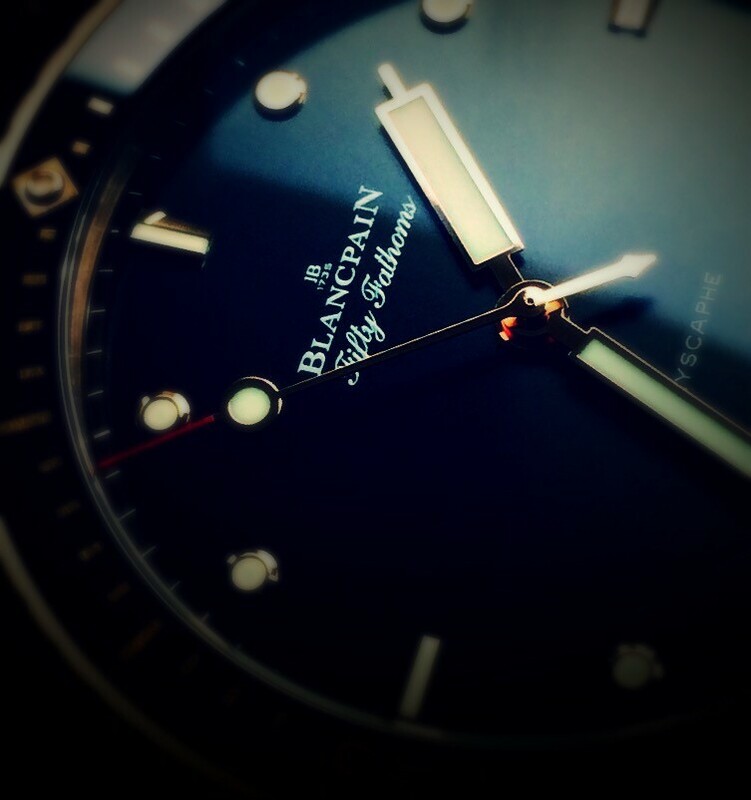 But I wasn't as fast as Blancpain itself, this version was gone before my decision process was ready. At first I was very disappointed, certainly after seeing the pictures of Adam. But after a while I realized that titanium was one of my favourite materials. When I saw the watch in the shop window, with the sailcloth strap I liked best, I knew it was mine. It really is my favourite daily wearer, very difficult to put down. But I prefer the chronograph version. Where to begin? Of the 2 Bathyscaphes I own, it really comes down to which one is on my wrist. But then I put on the stealthy black ceramic and revel in the fact that no one notices it. Amazingly liberating and a real kick to be the only one who "gets it". Of the ones I don't have, well I've struggled with the Sedna and almost succumbed twice. I'm afraid that the next time I won't get away. That blue dial chrono looks better than this black dial. 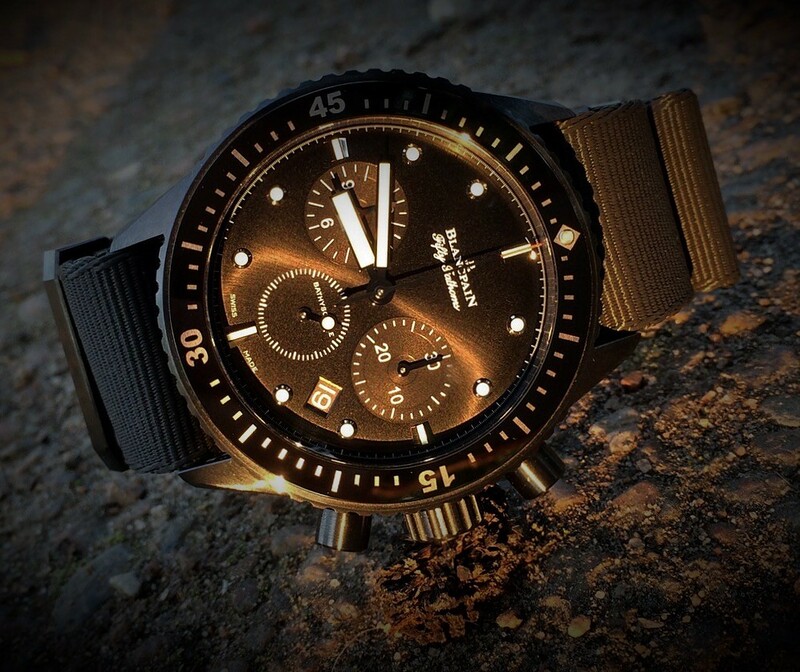 The Bathyscaphe chrono is a fantastic watch, just as the three hands watch. 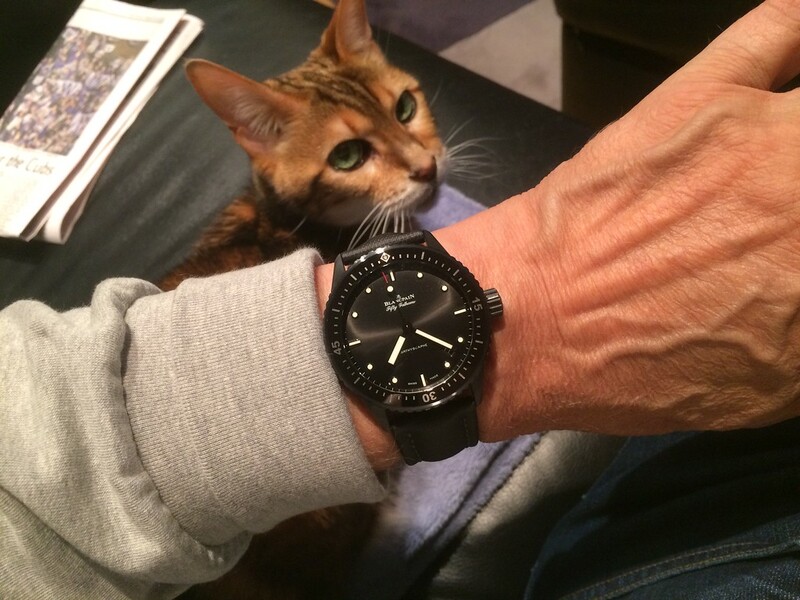 This particular version sat perfectly on my wrist, very light. But I didn't buy it. First, I hardly ever use a chronograph, so I would only buy one because it looks nice. What really hold me back was that the whole watch was too black: it looked gloomy on my wrist, it was too one dimensional. To compare it with my titanium three hands watch: both case and dial have some subtlety in their darkness, there is a surprise in that faint sunray dial which makes me happy. There you are, watches are emotion. are full of subtleties that take time and different lighting sources to fully appreciate. That also makes them hard to photograph, but I'll keep trying! 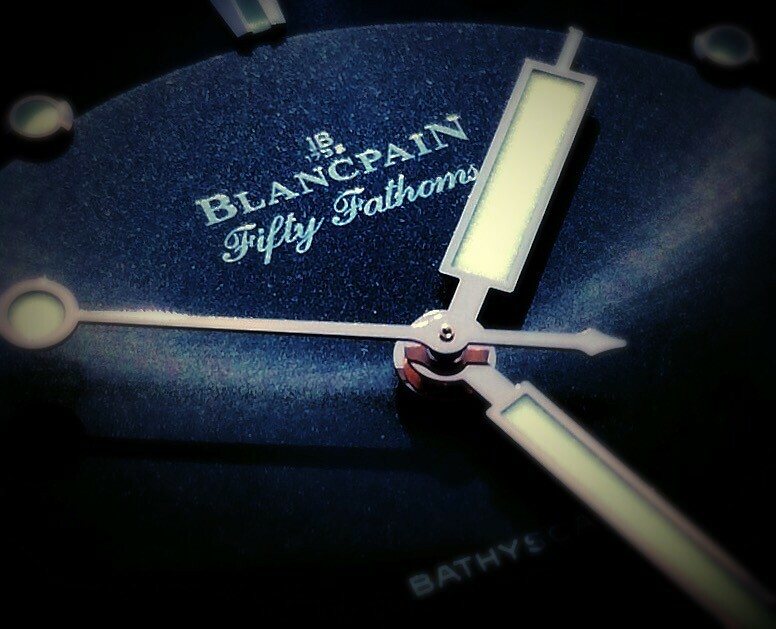 Your picture shows a beautiful dial indeed, I wonder whether this is the same dial as used at the titanium version. I don't know the answer. I've seen the steel with gray dial but not the Titanium. I believe it is the same as the Sedna except for the marker surrounds. ... but as you already mentioned the finish of the markers (and hands) is different between the titanium, ceramic and obviously the gold versions. That's what I like so much about Blancpain: it would have been easy to use the same markers and hands for the titanium and ceramic Bathyscaphe, but they chose to realize two different options, each going well with the overall appearance of the respective watch. 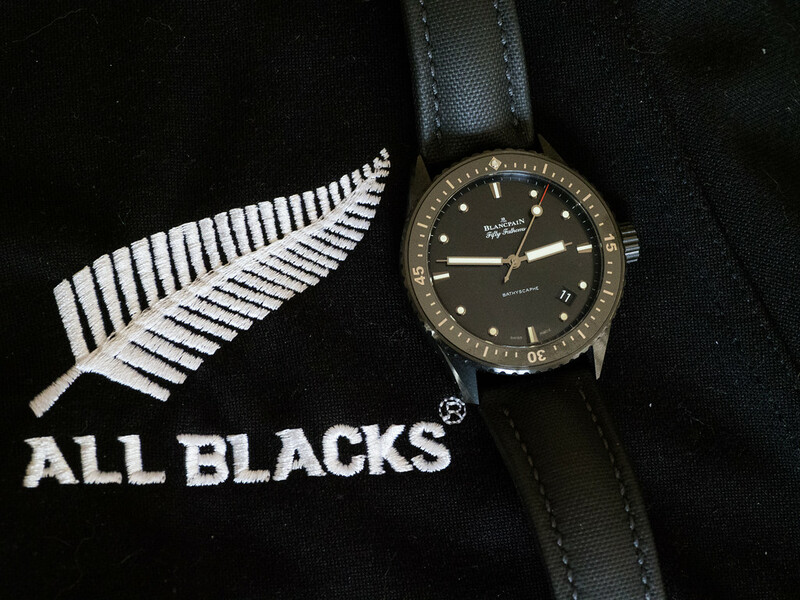 I like the all black ceramic 3 hander although I own (and love) the steel three hander with sunburst grey dial. Had the pleasure of trying 3 similar models at my nearest AD last week, all were 43 mm on sailcloth straps with full deployant. I liked the blue dial, ceramic case best although the price is a bit too much and I've taken a few tumbles hiking mountains so I also would worry about shattering a case lug out in the wild. 2nd place and most likely my next watch purchase is the sunburst grey dial, steel case. The dial is just amazing and the bezel actioni is as good as any Rolex or Tudor I've tried. 3rd place is the darker grey dial, titanium case. Even though I love titanium in general, the bezel action on that Bathyscaphe was noticeably worse than the other two due to metal-metal galling (I believe) similar to what I find on my Ti Mido diver and Ti Breitling Aerospace. Most interesting was how similar in weight each watch was. Having the same weight of strap, crystal, and movement seems to somewhat minimize the differences between 3 case materials. The classy meteor grey dial on the steel version is a nice pick, and it goes well with different colors when it comes to straps. Plus you have the option of the bracelet. What I have not heard about is the availability of a deployant clasp for the ceramic Bathyscaphe, though. Did you by chance take any photos? Alas after a rushed 2-hour drive to get to this AD before they closed, I left my phone in the car. It's possible the ceramic case had a pin buckle but all 3 models were on sailcloth. ... 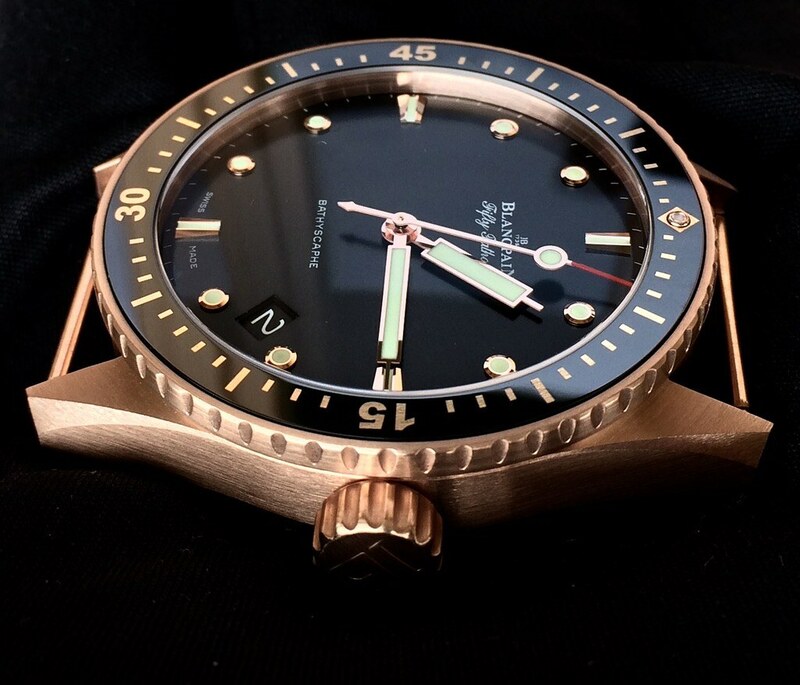 I would actually appreciate Blancpain to offer a deployant clasp for the ceramic Bathyscaphe, since the execution of the deployant on the steel FF and also the steel Bathyscaphe is simply outstanding. Previous Topic: A new blue dialed Fifty ?